It seems like most books on developing for Android are geared towards beginners and those who are accustomed to developing for other platforms or using other languages, while fewer help you put that extra layer of polish and shine on your app. With hundreds of thousands of apps already on the market for you to compete with, that's exactly what you need: something to kick your app up a notch or two. Thanks to informIT, we have just the book for developers looking to learn advanced techniques - and we're giving away 10 copies of the eBook. As you've surmised from the paragraph above and title of the book, Android Wireless Application Development Volume II is written for those who already know the basics, but want to learn advanced skills and tricks. 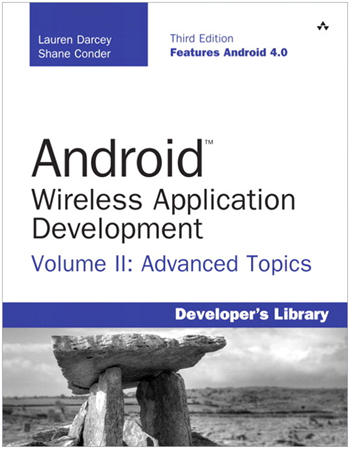 Android Wireless Application Development has earned a reputation as the most useful real-world guide to building robust, commercial-grade Android apps. Now, authors Lauren Darcey and Shane Conder have systematically revised and updated this guide for the latest Android SDK and tools updates. To accommodate their extensive new coverage, they’ve split the book into two leaner, cleaner volumes. This Volume II focuses on advanced techniques for the entire app development cycle, including design, coding, testing, debugging, and distribution. Darcey and Conder cover hot topics ranging from tablet development to protecting against piracy and demonstrate advanced techniques for everything from data integration and UI development to in-app billing. This book is an indispensable resource for every intermediate- to advanced-level Java developer now participating in Android development and for every seasoned mobile developer who wants to take full advantage of the newest Android platform and hardware. The book is written by Lauren Darcey and Shane Conder and spans a whopping 528 pages - definitely not light reading intended for beginners. informIT has been generous enough to partner up with us to give away 10 copies of the eBook. To enter, just leave a comment telling us what kind of app you want to create with your newly-improved skills. Be sure to include your email address so that we can contact you if you win. The contest is open to everyone in the world (fully international) and will run from today (Wednesday, July 18) until Monday, July 23 at 11:59 PM PST (the book's release is July 24). Winners will be chosen at random and contacted via email.